It’s here!! 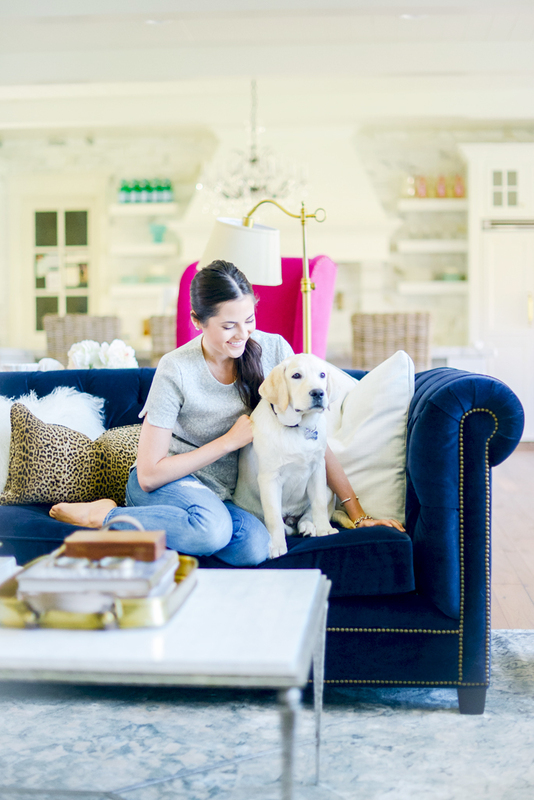 Today I’m so thrilled to share with you the reveal of our living room designed by GateHouse No. 1. I think the thing that I love most about this space is that it reflects my personal style so perfectly. It’s been a space where we sit and talk with friends and family for hours and has made our house feel like a home (and once I get around to putting family photos in all those frames it will be that much better ;). I hope you find some inspiration for your home through these beautiful photos shot by Heather Telford. Thank you so much for all your sweet and kind comments about our home, it really means the world! 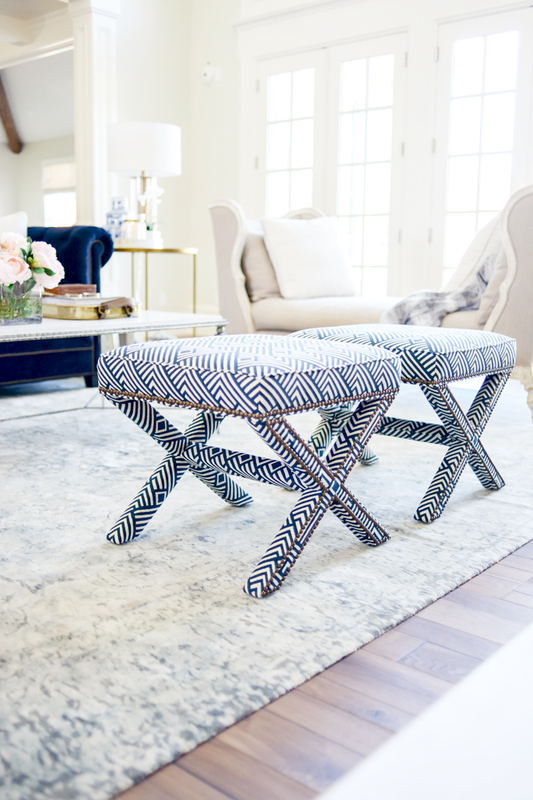 In case you missed it, be sure to check out the design portion of our living room reveal. When I post photos of my home I to get tons of emails and questions about the furniture, accessories and paint colors so I’ve provided all info below if you’re interested. All upholstered goods are by LEE Industries c/o. To find a LEE vendor in your area you can go here. Tufted Club Chairs: #1758-01 | Fabric: Farrow-Silver with an antique brass finish. X-Base Ottomans: #9168-00 | Fabric: Deco-Navy with standard natural nailhead trim. Pink Velvet Wing Chair: #1603-01 | Fabric: Winthrop-Blossom with platinum spaced nailhead trim and weathered gray finish on legs. Neutral Pillow: Carlisle Aspen fabric with Sheer Glazed Sea Foam Flange. If you have a question about anything that wasn’t provided above you can leave it in the comment section below. This post was brought to you in partnership with GateHouse No. 1 and LEE Industries. Beautiful home and room!! The sources are excellent and much appreciated! Question: Who makes the gold bookshelves? You have such a lovely home! But thats to be expected from someone with your great taste! I’m in love! It looks amazing. Seriously if I could have my dream living room this would be it. Beautiful job I love it all so much. I have loved your home interior space since you began posting the building process!! It has come together beautifully! What’s the name of your rug? I just love the colors and pattern. hi Rachel.. regarding the rug… what size is it? I’m not sure. If you call GateHouse, they can give you all those details! Stunning. I love the bold couch — great pop of colour! Hi Rachel! I’m totally in love with your house great job ! I’ve a question but it’s not for your living room. May I ask where Can I find those beautiful roman shades you have in your bedroom please !! Thank you so much ! I also love your roman shades. Unfortunately I don’t live in Utah, would you be able to tell me what brand and exact color is the material that was used for the shades. I live in NY and was hoping to find the same material. Thank you very much! I have no idea what the exact color is or the material, I do know that it’s some type of linen blend and they are the no sew roman shades. I showed my window treatment designer a photo that I liked off pinterest and she made them look almost exact. I bet if you showed your designer a photo of mine she could match them for you! Thank you very much for your response. You said its a no sew shade, so I looked on pinterest and find few that calls for a mini blind to use when making the shade, Is that how yours was made? Is your cordless? Sorry for all the questions, but I really love your roman shades. Hi, Rachel! Could you please give me the information for the person who did your spindle/handrail work, please? ??? Hey! I was wondering if tou could give me the number of your designer so i can call her about the roman shades in your old house. Thanks! Beautiful Painting! It’s the canvas print not the canvas wrap? Also where did you get the gold frame for it? beautiful painting. you have a canvas print not the canvas wrap? also where did you get the gold frame for it? Is the Canvas print framed in gold then? Where did you have that done? Thanks! You have such a beautiful home! 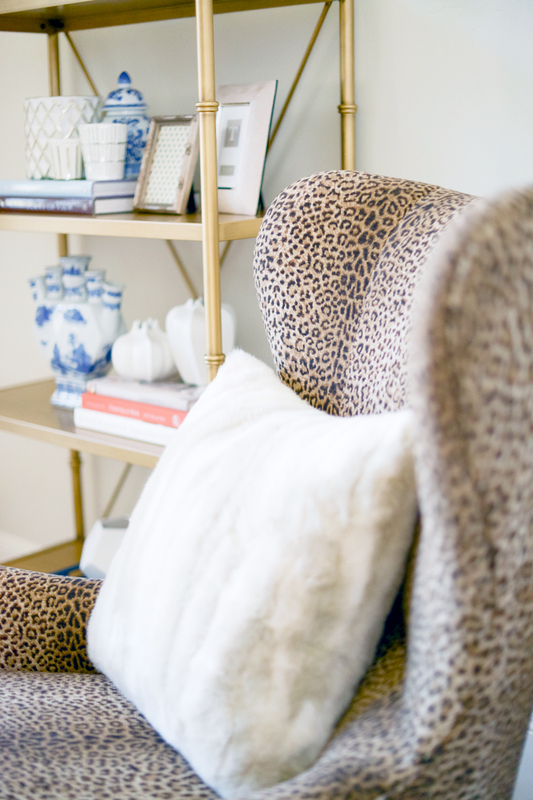 Blues and leopard print are on my living room inspiration board! Gorgeous! I love the photos. Where did you get the lamp on the desk with the gold base and the candle holders on the mantle? Looking for something exactly like that and haven’t had luck! Thanks! I love your huge fireplace! My only question is, is it useable? The styling makes it look like you don’t plan on using it for fires. It would be a pity not to take advantage of copying up in front of it on cold winter days. Absolutely love! Everything is spot on…what a beautiful room! May I ask where you got the Christ painting? It is one of my most favorites and I love the size of yours! Thanks! Love it. everything is perfect! where did you get the picture of Christ? How about the Jesus walking on water print? That is stunning, and the room looks great! I absolutely LOVE everything about your living room. 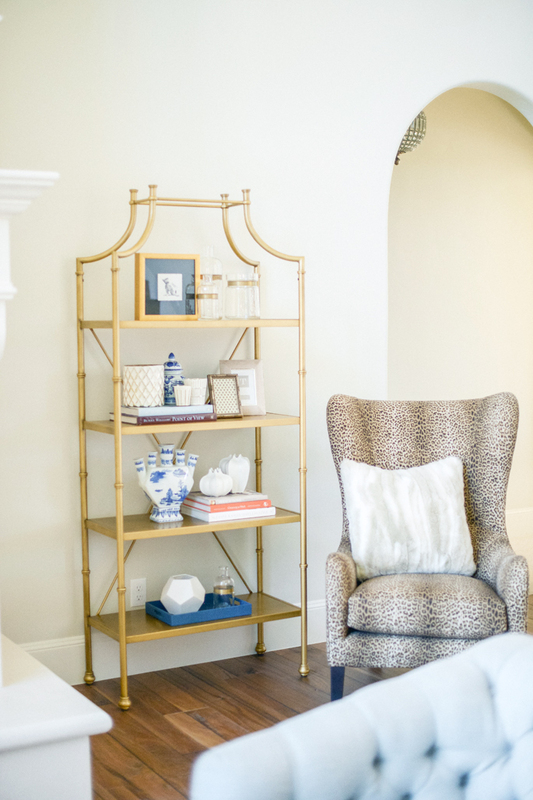 Can you share where the gold shelving unit is from? It is amazing! It’s randomly from Pottery Barn Teen. Super good price for what you get! It looks gorgeous! Loving all the little trinkets too. This room is so inspiring. Thank you for sharing your beautiful home. I want to transform my living room and use navy and white and you did it so elegantly. It is beautiful. Hi Rachel! Love your home! I am wondering where you got the gold tray with leather handles? Thanks! This is amazing… i love it all!!! But I’m wondering if you could tell me where you got the large photo and frame of Christ. Its perfect. I got it from here: http://reflectionsofchrist.myshopify.com/collections/frontpage/products/walking-on-water. 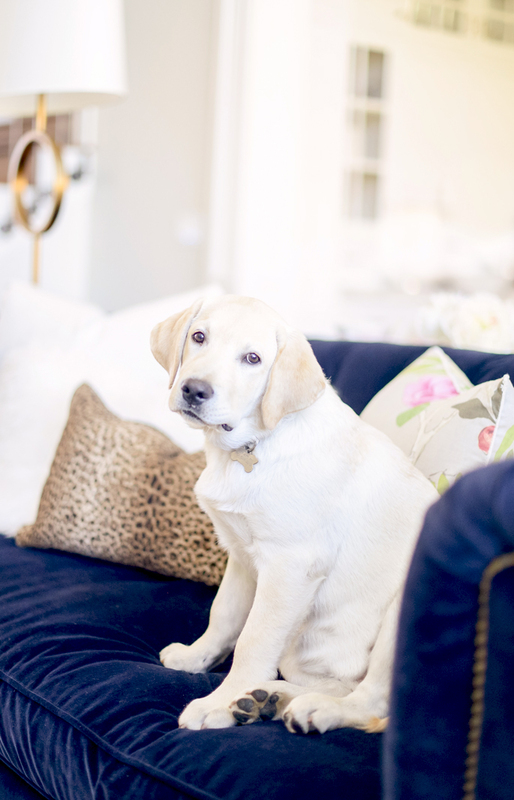 I love everything, especially you adorable pup and beautiful velvet blue couch and pink chair! Beautiful! :) I love that PINK chair but, please share where you got the large picture of Christ. It is beautiful!!! So chic! Beautiful living room. It looks so cozy and inviting! wow, your space turned out wonderfully!!! i could definitely see spending ours on end there, gathering with friends and family or just reading a book! Your living room is so beautiful. The most beautiful living room I have seen. Congratulations! Beautiful room Rach! I love the rug and that blue sofa! How fun is that sofa! Where is your daybed / chaise from? I’m so in love with it and have been for a while. Would love to know where you purchased it. Your home is gorg!!! Where did you get your crystal lighting from ? Also did you paint Ashwood in half tint, or full tint? Wow. This is absolutely stunning. No other words to describe it. love the colors! so cozy! Absolutely breathtaking! I love all the blue hues. You did an amazing job. When I get a house you’re going to have to style it. I’m in love!!!! I am loving your couch and office chair! Beautiful! Thank you for sharing your home with us. Stunning!! You truly have the most beautiful home!!!! I am loving all the textures and mix of rich colors with light and fresh colors! Wow, Rachel. Your home is beautiful!! I love the rich blue color of your couch. Can’t wait to have more space than my 650 sq. foot NYC apartment! Just gorgeous! Could you please tell me who the artwork is by? So pretty, Rach! I love, love, love the gray chairs! However, I’m curious to know, I see mostly your style, but feel that Drew had no input in the design of the living room. Did he choose or provide any input or did he let you take over? Where did you get the photo of Christ? I cannot find the right words!!! This is such a beautiful space!! It’s modern and chic but still warm and inviting! So perfect. Beautiful – just beautiful!! 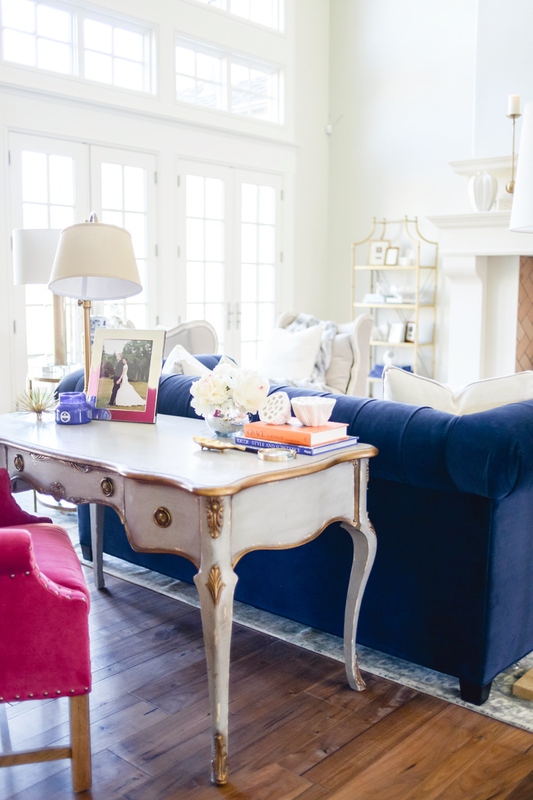 I love the blend of the soft palette with the pops of colour – especially the pink chair and the blue couch. You’ve done an amazing job so enjoy living in the space now!! I have never found a picture of Christ that I have connected with. This one is stunning. Do you mind sharing the artist or where I can get one? Thank you! The navy chair color is fantastic. Your staircase handrails are exquisite and like, like many others love the Christ picture. I understand decor is your area, but I must say your house looks and feels like it is JUST YOURS. It is entirely feminine, not family or even husband/wife catered. Where is Drew’s space in YOUR house? where did you get the jesus art work? Gorgeous home! Love the gray and blue tones with gold accents! You have such a gorgeous living room; so chic and elegant! The sofa is such a great color–it looks so soft and wonderful! May I ask where you found that amazing piece of art on the wall? Love it! Absolute perfection. Loving the color combo as well! Your home is absolutely gorgeous!!! I love how you mixed and matched your furniture pieces – the colors all go together so well! amazing!!!! what a beautiful living room. Love it! However, blue velvet with a yellow labrador, very brave! I have two yellow labs….. This room is absolutely perfect. Stylish but not stuffy. Cozy but still chic. Love it! your home is absolutely lovely! adore the living room! I absolutely adore this! It’s so elegant and homey at the same time. Too beautiful. A+ work! This is the most divine space. Truly it is absolute perfection. Could you please please let me know where the coffee table is from? I really hope it wasn’t already mentioned above but I am DYING to know! I would be so very grateful. Again, this space is amazing. Thank you for sharing! I love your posts I have been following your blog for some time now. I wanted to ask you about the large portrait hung on your wall, is it custom made? It is absolutely lovely! Absolutely love your living room! I am speechless… Your living room has inspired me to revamp my space. Thank you for your post! Congratulations on your home. It is gorgeous! Do you mind telling me what kind of hardwood floor your have? Where is the large artwork of Jesus walking on the water from? I love it! I absolutely LOVE this! That paint color is fantastic, I used that same color in my apartment. And that pink chair! The whole thing is very well put together! So in love! The new room looks amazing! I love how everything is so different, yet it all comes together and fits your personality and taste perfectly. I absolutely love your home! It is so stunning and beautifully designed & thought out! LOVE LEE Industries & All of the people there in High Point, NC I want to take everything home with me when I go visit during market! Beautiful room! Was wondering where you got that picture of Christ on the sand? It’s beautiful. Thank you! We got it from http://www.reflectionsofchrist.org/ ! Stunning. I agree, more pictures of your kitchen and exterior, please. Is your fireplace wood burning or gas? Do you mind sharing the vendor and name of your kitchen hardware and gorgeous railing? Such a beautiful space Rach, I adore the blue velvet Chesterfield & attention to detail with the accessories. Hi Rachel! Your living room is spectacular! The blue velvet couch is to die for!! What is your flooring? Its perfect! I love it! Thanks!! Wow … just gorgeous! I am sure you are aware of the beauty … but this tops everything I have pinned on Pinterest! Thank you for sharing! How is your sofa with Dash? We have a white golden retriever and I was thinking her fur would make the sofa white! You like yours with your dog so far? Hi Rachel ! Can you please tell me where you bought the Gold Peace Sign Hand on the fireplace? The room is just lovely !! Thank you ! I would also like to know where the gold peace sign hand was purchased!!! Wow! Such an absolutely gorgeous space! 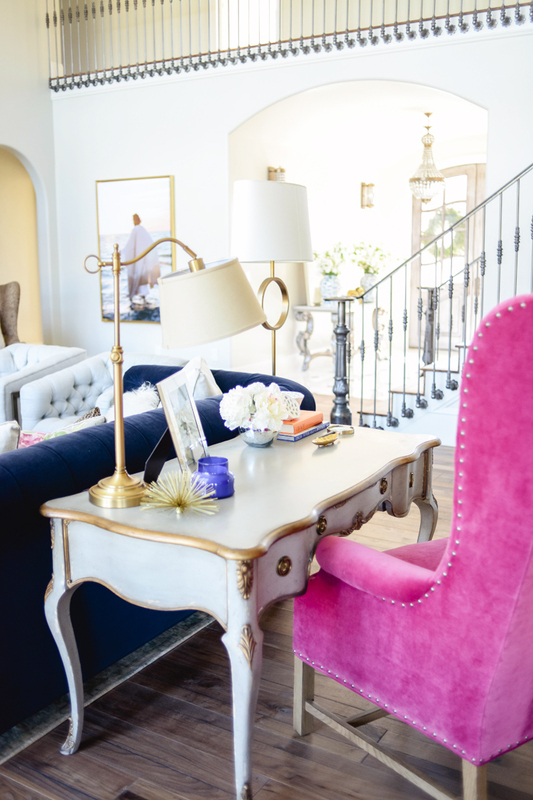 I especially love the desk behind the couch with the gorgeous pink chair! I love it, so inspirational! Thanks for sharing! Beautifully done! The large picture on your wall is that a painting? Where can I purchases it? Sorry, I read the other comments I see where you brought the large picture. gorgeous space! the gatehouse did such a good job! Rach! It’s like you read my mind! I was telling my husband just the other day how I wanted a royal blue tufted sofa with grey/neutral color accents chairs. Seriously! I love everything about the room. It looks amazing! I truly hope that you and your family enjoy it for many years to come! It’s like you read my mind! I was telling my husband just the other day how I wanted a royal blue tufted sofa with grey/neutral color accents chairs. Seriously! I love everything about the room. It looks amazing! I truly hope that you and your family enjoy it for many years to come! Rachel, your wall paint color is beautiful. 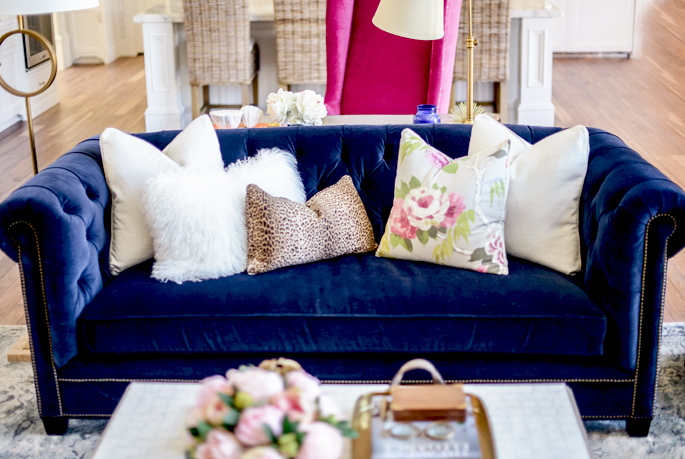 That leopard chair and the navy couch… so so pretty! I love how light filled your area is as well- you really are a lucky one Rachel having help styling your home. I LOVE how bright your home is!! What color stain is your hardwood? I love it! love this so much! that blue couch is phenomenal! great taste! I love what you and your designer team did with your living room. Truly, you hit it out of the ball park. My favorite touch and decorating piece is the Jesus portrait walking on water. I love it!!! What a beautiful art piece. May the love of Jesus fill your life, home and marriage. God bless and enjoy your new home. Thanks for sharing your beautiful home ideas with us. What a beautiful living room! And I love your puppy! Any tips for keeping a navy sofa clean with a white/yellow dog?! love the Jesus walking on water artwork! beautiful!! Rachel, your living room is absolutely stunning! I love all the furniture, it is hard to pick a favorite ;). So beautiful!!! I want to live in your house!! Your home is beautiful! So tastefully done. I love all the natural light too. Congrats!! I love everything about this room. All the patterns and textures came together nicely. 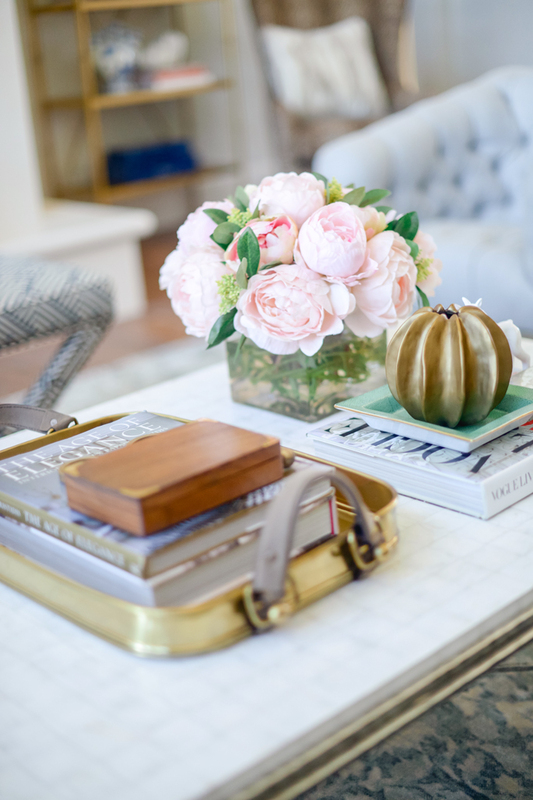 I love the way you styled your coffee table and shelf too. Your living room is amazing! That is absolutely beautiful! I love the colors and the dark blue accent couch is so nice with the pillows, I just love it! Your home is so gorgeous! There is so much I want to comment on…the fireplace, the entryway, that mirror, the coffeetable…the PUPPY! Thanks for sharing, wonderful inspiration! Hi! I love all your ginger jars! Where did you get the ones in your entry on the table? Beautiful! Just stunning! I would love to know where the round gold accent/end table table and lamp are from. This looks absolutely fantastic! My favorite parts are all of the gold accents (and shelves) along with the patterned seats. Gorgeous! Great job! 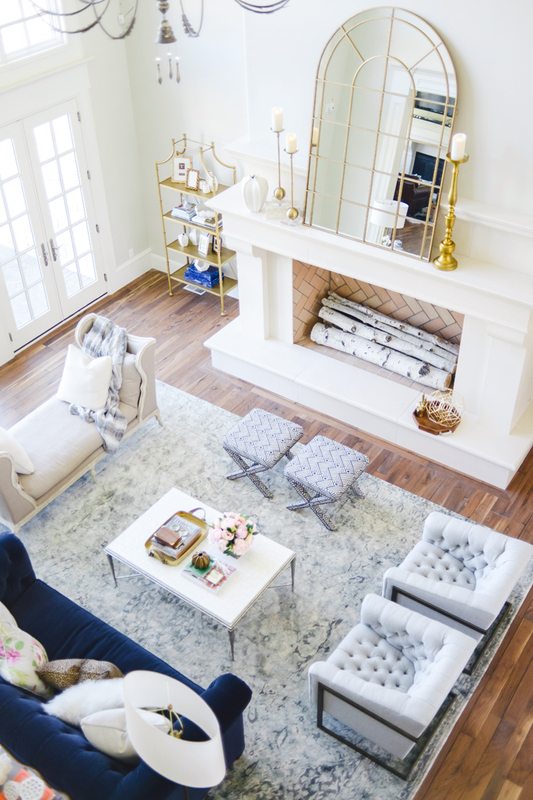 Love your living room space, i LOVE all the gold accents and your decode is incredibly classy! Beautiful room! Love your blog!! I have been looking for a similar coffee table forever. Do you mind sharing where it is from? Thank you! Absolutely stunning! We totally have a similar sense of style. Your home is beautiful and definitely has elements of my dream home. Thanks for sharing with us! Beautiful! I love all the decorative accents but my favorite item has got to be your exquisite blue couch! Hey… So like others, I love the reflections of Christ canvas. I noticed you told everyone where to find it. Thank you, just wondering where I get it framed? The gold is amazing? Can you share? Just wanted to say it looks lovely. I especially like the navy velvet sofa! Just curious, would you ever consider sharing your floor plans or maybe doing a house tour so we could see the general layout of the the spaces? 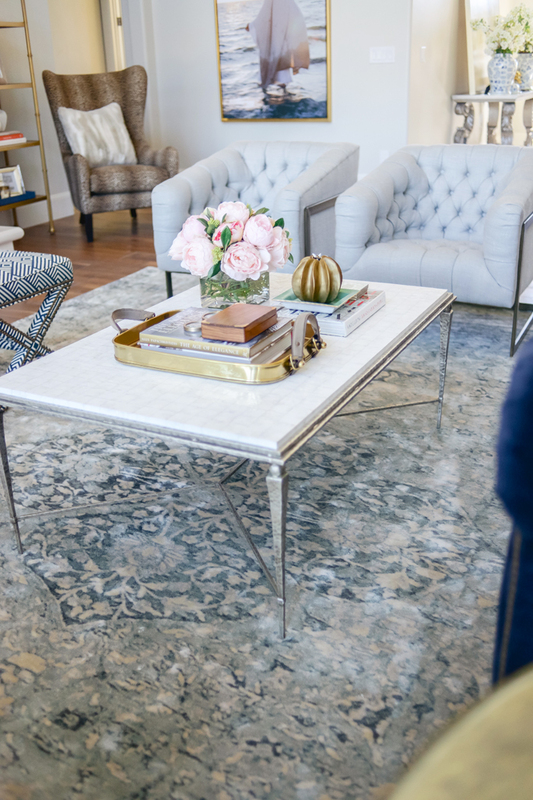 Can you share where the beautiful coffee table is from? Oh my goodness! How gorgeous! I can’t believe your dog is allowed on that sofa! LOVE the decor, so chic and beautiful. Very much reflects your fashion sense! I am in love with this space!! So beautiful! And such a cute pup, too!! 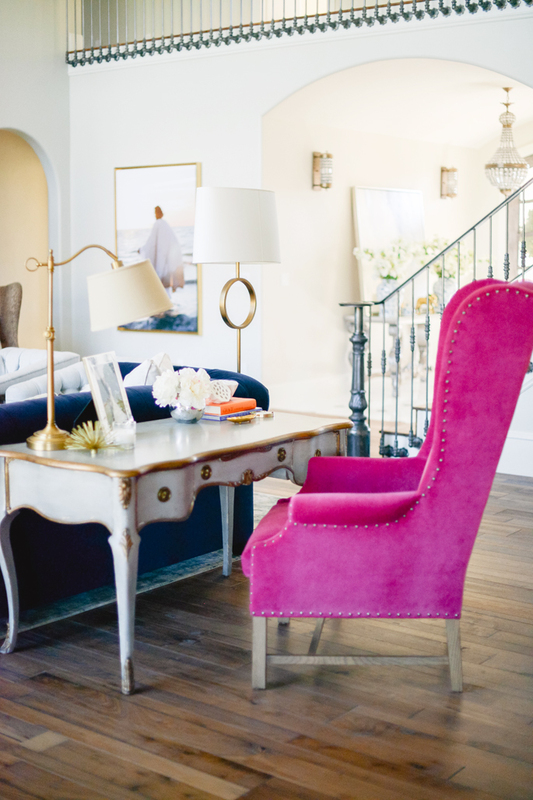 I would love to have some bold-colored furniture like that pink chair- stunning! Beautiful design. Thanks for sharing! Congrats! 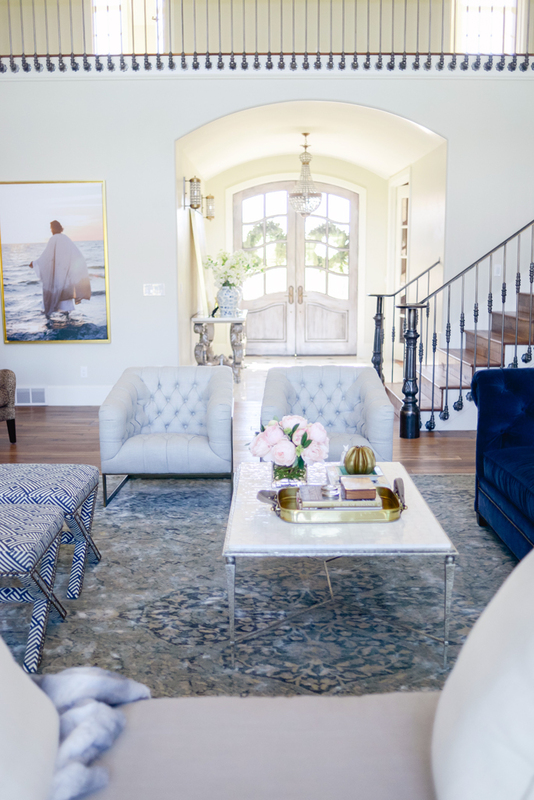 what a stunning reveal- and that plush navy couch is a dream- fab details- enjoy your wonderful home!! This is beautiful. I especially love the blue velvet couch, although it will not be that colour soon if you let that dog keep sitting on it! haha! I have a yellow lab too and all of our furniture had chunks missing out of the bottom half and everything is covered in hair.I’m sure it was just for the picture though. We have now a designated “LEVI” chair that he can sit on. Love those paint colors. I’m in the process of picking paint right now. Pulled out my Benjamin Moore paint decks and can only find a White Dove and a Dove Wing…..Is it one of those perhaps? Or am I just not seeing a Dove White? Wow your living room looks spectacular! Not only the space is great, your decoration ideas really make this room stand out. Nice work! Congrats with your renovation! Loooove the blue velvet sofa. It is absolutely gorgeous. All the small pattern for the furniture compliment each other. Amazing room! I adore that Jesus walking on water print. It’s the perfect tasteful religious addition to the room. This is just beautiful! Would you please share info on those gorgeous wood floors? I would love to know the type of wood and stain color — they look absolutely amazing! WHAT IS YOUR FIREPLACE MADE OF AND WHO IS YOUR FABRICATOR? Perfection!! It is so inviting yet has a formalness about it too. My fave is the navy sofa and your use of mixed metals!! I had dark blue sofas before I got my white lab. I can’t stand the hair on the dark wood floors or the furniture. How can you take it on brand new furniture? Love your design! I am looking at getting new hardwood floors and love what you’ve picked. Can you share what type/color/brand your floors are? Thank you for sharing! Really love this style. Such a great mix between modern and more traditional. Lovely photos too. And that velvet sofa is gorgeous! OMG! That’s beautiful! I love all the light that comes into your house! I’m obsessed! I love this look. Not sure if I could keep the white on white effect looking so nice in my home but a girl can dream! Hi Rachel! Is the faux fur throw from Gatehouse as well? I can’t get over your beautiful home! The cheetah chair, the gold accents, even your front doors! The room is fabulous! Fuschia and cobalt blue are my favorite colors!! Can I move in !! Can we see the rest of the house? This is absolutely gorgeous!! Obsessed with how this was designed! And I love both the blue couch and pink chair! Stunning. I love the daybed also.Is that a Lee piece? Your house is stunning!!!!! Rach- How big is the navy blue velvet sofa? Thank you! 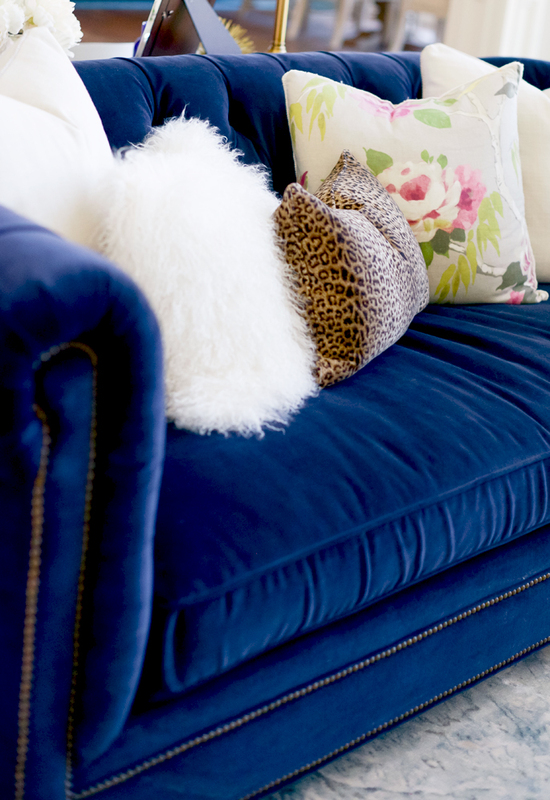 Adore the navy sofa + gold to tie it all in + the cheetah! Comfy and elegant too! Bravo! Rachel!!! Holy crap, your house is gorgeous. Obsessed! I was just as excited for this as I was for the closet/office space reveal. Your home is so beautiful and I love how you can see a little bit of you & Drew in the living room. It’s beautiful, but not overly feminine. Plus I love, love, love that pink chair, especially next to the navy couch. Everything about this is perfect. Beautiful. You have exquisite taste. Congratulations on your new home. Beautiful! Can you tell me the brand of the chandelier above the sitting area in the living room. You can see a small portion of it in the mirror over the fireplace. Exactly what Im looking for. Thank you. Where can I find the candle pillars on your mantel? Thanks!!! Such a lovely redesign! The space feels light and airy while still being cozy all at the same time. That is very difficult to pull out, but you have really done it! M.
Such great inspiration for my new living room! I absolutely love the cool tone color palette of this room! It goes perfectly with the crisp, clean white walls. 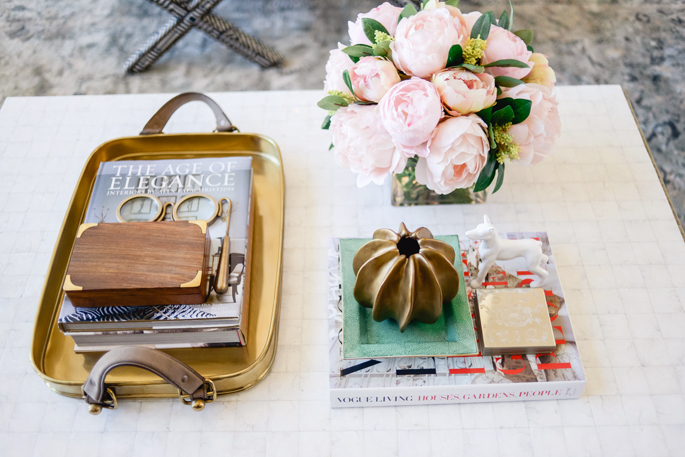 The eclectic accessories add dimension and color, keeping it interesting! Stunning! I can definitely see your personal style aesthetic infused in this room – love it! Love your home! Did you purchase this custom home from Desiree from Decor de Provence??? In Utah? Lucky…that home is fabulous and you have added a little glam to this old world home. Enjoy! This is a lifesaver. I am considering using your paint color in my house. What type of exposure does the room have? Mine is north. And does the color take on a different hue at night? Thank you so much for your reply. Love, love, love your living room. Beautiful. The brass tray with leather handles really caught my eye, but I couldn’t find it on the GateHouse website. Where did you find it? Hi! Where did you get your little round gold side table-by the navy couch? Where did you get the brass peace sign hand? Where did you get the picture of Christ framed? Can I ask where your coffee table is from? I just love your living room reveal. My husband and I are buying a new house and I am planning on copying a lot of what you have here from the club chairs, to the rug, to the ottomans. So glad that Lee Industriies has a few distributors near me in Chicago! Which artist did the photo of Christ walking on water? It is beautiful!!! Hi! I love your blog and what you have done with your living room! Can you please do a kitchen reveal?? Yes! Working on it, it’s still not finished but once it is, I’ll definitely do a reveal! Hey Rach, where did you frame your photo of Christ? I love the gold. Did you custom frame it? Thanks! Hey Rach! Where is that beautiful image of Christ from? So beautiful! Where can I find the rails for the stairs? I love the stairs and rails. Can you tell me the builder name and floor plan on your home please? We are building a home and I love this layout and floor plan. Any information would be greatly appreciated. Thanks so much! I would like the info as well for the spinals and railing. We are also building a home and your living room has truly inspired me to create something with a WoW factor ;o) Thank you in advance for the information and for inspiring us. Life in living meets with luxurious comfort and warmth at film city ahmedabad jackie shroff. Your home is so beautiful. Thanks for sharing! I live in Northern Utah (Logan area) and noticed that you mentioned that your husband built your home. Does he do consultations? I would be very interested if he offers something like that. And, one last thing… is the gray fur throw shown included as part of the accessories from Gatehouse or is it from somewhere else?! Thanks so much! I love the airy feel mixed with the amazing upholstered pieces. I have to find out where your white marble coffee table is from? I’ve been looking for something similar for awhile and keep coming up short. Mind sharing? Thank you! Your home is gorgeous! I enjoy reading your blog. I am remodeling my new home in Madison, WI and I am having the hardest time finding a good walnut color wood floor. I really like your floors…do you mind sharing what your floors are and where you purchased them? Your home is beautiful. I love the picture of Christ–where did you get that framed? What Christ picture is that? It’s beautiful!! Please, what is the name of the rug from the gatehouse no. 1 site?? I actually don’t have the style number of this rug. If you call Gatehouse no.1 (their number is on their site) they can give you the style name and vendor info, even order it for you if you like. :) Hope this helps! I just ordered it! Thank you so much for your inspiration and amazingly beautiful taste!!! Just ordered a blue suede chair from a gallerie as well! Your vision mixed with mine is actually coming to life! Thank you!!!! Jaclyn im dying over the rug. So jealous you ordered it! Could you share the name and vendor? I live in CA so I’m hoping i can find it here. I know this post is a while back, but I’m hoping you can answer a question for me. I follow you on Instagram & love what you’ve done with your new home. I have tried your paint color Ashwood & it seems darker than in your pictures. I know a lot of designers lighten shades by 50%. Do you know if your paint was made a percentage lighter? I would really appreciate it if you could tell me! Thank you! I’m painting our new home and also found that ashwood was really dark. Were you able to determine the percentage that the color was lightened? I have the exact same question –about to paint our house and I love the look of ashwood and white dove together, as seen in your beautiful home!! Looking at the colour swatch though, ashwood looks darker and quite green. Please let me know if you find out if your colour was lightened at all! 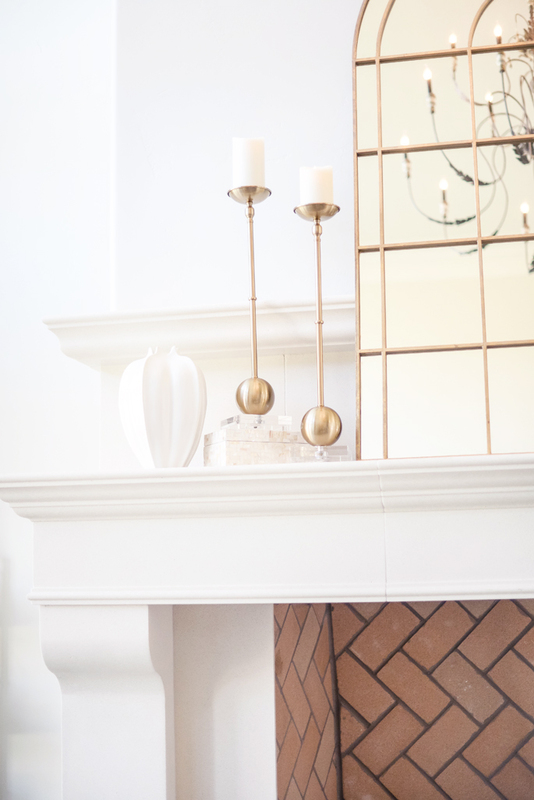 Where did you purchase the gorgeous gold bookshelves? Never mind just read through the comments and saw that you purchased it on PotteryBarn teen. What color is your hardwood? Tia!! its absolutely amazing!!! i love every thing about it, its just perfect!! congtrats!! i wanted to know where is that side accent table from (gold and mirrored glass) next to the navy couch??? do GateHouse ship to Canada? hehehe!! Hello Rachel, I came across pics of your closet. It’s so beautiful. I’ve bern trying to find an ottoman like yours for my closet. Can you tell me where you purchased it? Where did you get that amazing coffee table love it!!! Omg this room is unreal, love it. Do you mind sharing where the coffee table is from? I have been searching endlessly for one i love–and i love this! I would love to know that too! Where did you find that table? I love it!! Rachel – I love your house! Do you know the color stain of your wood floors? Or did you get pre finished floors? I am about to stain ours and love your color! Can you pretty PLEASE tell me where you got the Jesus walking on water framed? Did you buy the wrapped canvas or just the canvas print? Thanks!! You have a a beautiful home! I’ve been looking for a chaise lounger similar to yours to furnish our newly constructed home. Do you mind sharing your source? Where did you purchase your Gold Etagere from? Stunning! Where did you buy the print of Jesus? I was just so curious how much doing your house cost. I love everything you have done with the natural light and installing the kitchen, not to mention your design style. I am looking to doing something very similar and am curious about the cost. Love your home! 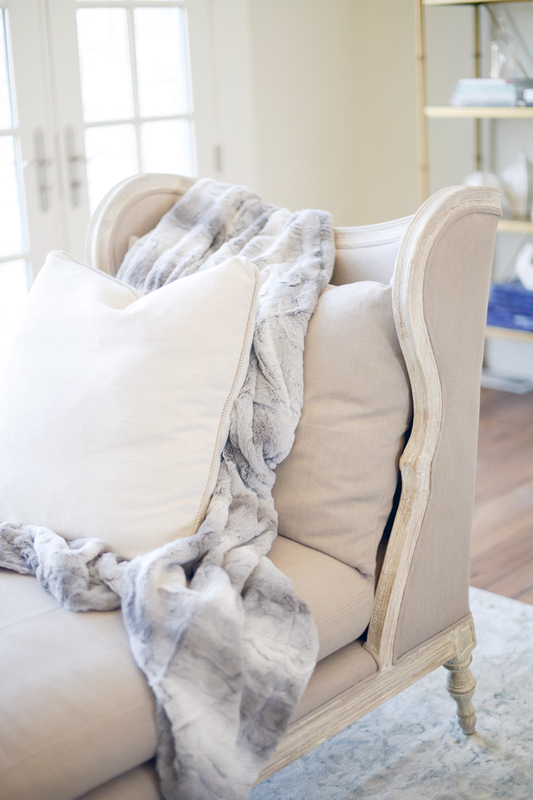 Love the relaxed but chic look of your home! Great job!!!! I was wondering where you got your front doors from? And also what paint color you used on your kitchen cabinets. Also, if you could tell me what manufacturer you used for your stairs. We are currently shopping for items for our dream home so any information would be greatly appreciated!! Thank you so much and again fantastic job and congrats on your lovely home!!! I am interested in finding out about the chandelier. Who makes it? I know this post is older, but I was wondering if you could answer a quick question. You mentioned Drew made your fireplace, but where did you get the herringbone pattern inside the fireplace? Are they sheets? I’ve had the hardest time finding them – any help would be so appreciated! Where did the front door hardware come from? I’m in love with that fur blanket!! Where did you find it? What are the colors of your wood floors? I love them!! The pink peonies featured in your living room and baby girl nursery , where are they from? Hi Caroline! They are actually silk from Alice Lane!! They are the best! hello! do you know the color and type of wood floors you have?? love them!! Hi, Rachel! 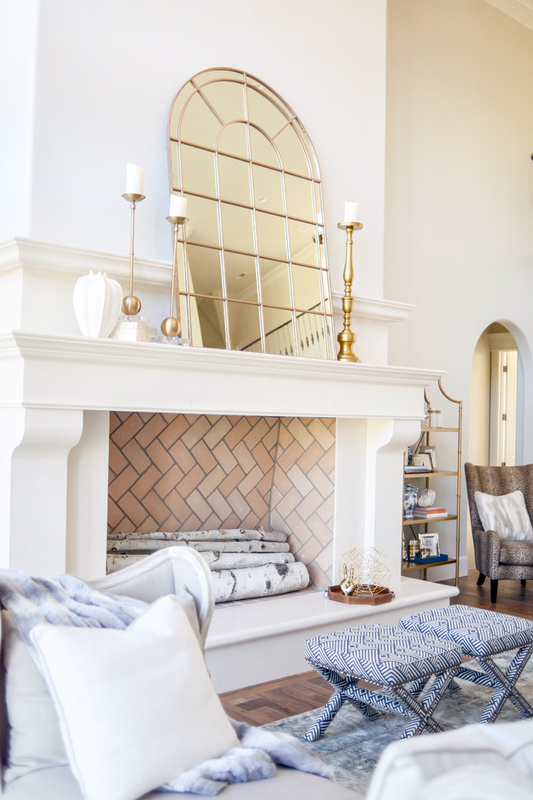 Would you mind sharing what color you decided to use on your mantle in your living room? where did you get your chandy?? Hi! Love your sofa! Any idea what finish is on the legs? Thanks! Your house is amazing! Love it! Do you remember the make and color of your wood floors? I’m also interested to know where all the hardest is from for your stunning staircase! Please let me know! I’m redoing mine soon! Thanks! Your house is so amazing. Where do you buy the art. I love the one in the living room of Jesus. Do you mind telling me where you purchased it. Thank you! The Christ picture is from reflectionsofchrist.org! What is the interior color of your front door? what is the interior color for your front door? It’s a stain thats a silvery satin color! It was custom made. Sorry to bother you on an old post but. ..
Where did you get the chaise chair lounge in front of the windows? We were recently in Newport, RI visiting the mansions and several of them had a VERY similar chase. How is the couch holding up to fur baby’s sheading? I am a mom to a golden retriever and chocolate lab? Where did you get your flowers and desk lamp? 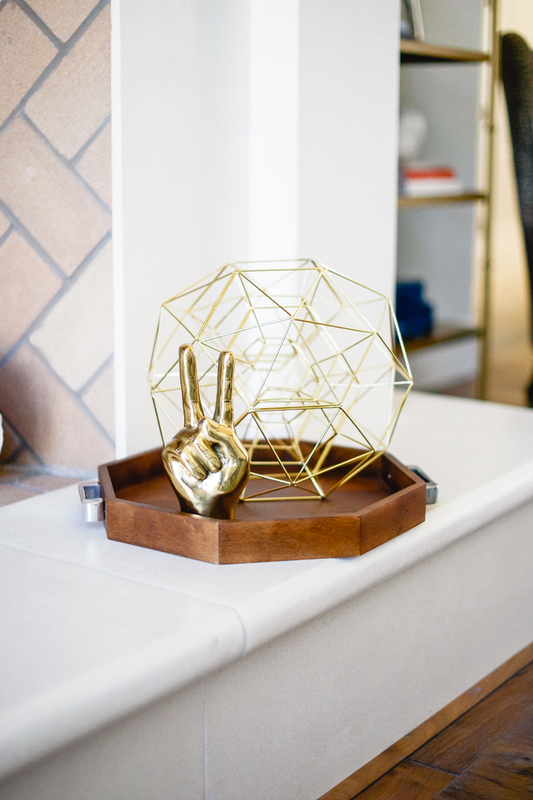 Do you know if the gold peace sign accessory shown on your fireplace is available to be sourced and purchased? Or would I need to reach out to GateHouse No. 1? Amazing in every way! I’m obsessed with your hardwood floors!! Do you happen to know the color and wood used? Thank you!! LOVE that chaise- can you tell me the name of it and where it is from? Thanks!! Rachel, beautiful home! My wife and I are DESPERATE to find out any info on that chaise lounge you have… a name, make anything. It is exactly what we need, but we can find it ANYWHERE!! HELP!! Gorgeous! What paint sheens did you use for the trim and walls? I LOVE YOUR HOUSE, YOU DID AN AMAZING JOB!! I HAVE A QUESTION, DO YOU KNOW THE NAME OF THE TYPE OF RAILING YOU USED OR WHERE YOU GOT THE RAILING FROM? Where I can find the painting of Jesus? I love it…your entire house is gorgeous. Do you remember the make and color of your wood floors? Hi Rachel, you have such a stunning home and thank you for sharing! I am redoing my staircase and I was wondering where the metal rods that meet the wood for your staircase are from? Thanks! Your home is absolutely beautiful! I was wondering where you bought that beautiful painting of Jesus? Thank you! Its from http://www.reflectionsofchrist.org! Hi, Rachel. If you wouldn’t mind, could you please give me some information on who built your staring case spindles? Hi Rachel – I love your marble coffee table, I’m looking for one just like it. I saw a few comments asking where you got it, but didn’t see a response. Are you able to share where it’s from?! Thank you so much! Still in love with your style. Name of the rug from gatehouse please? Can you please tell what size is the rug. I love your blog!!! Are you kitchen cabinets painted Dove White by BM as well? Would you kindly share where the coffee table is from? 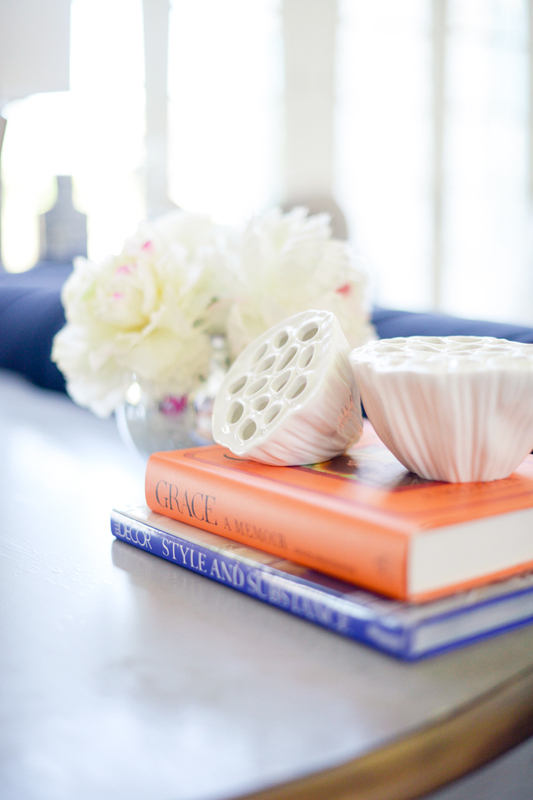 Such a beautiful accent in your stunning space. It’s old, but I bet you could find a similar one at Gatehouse, Alice Lane, or Restoration Hardware! Thank you! Your space is beautiful! I’m wondering where your coffee table is from? I just love your railing along your stairs! Can you tell me what it’s called and who makes it? Which Navarre flooring did you choose and are you happy with it? Thank you so much for your inspiration and amazingly beautiful taste!!! Beautiful home!!! Can you please tell me where the entry chandelier is from?!! where did you get the picture of Christ from? where is your chandelier from ? I love it ! I know you no longer live here but I’m dying over your hardwood floors. Do you or Drew happen to remember the stain/type? Thanks!!! Hi Rachel. I love your fireplace. What are it’s dimensions? I love how large it is. Thanks! Hi rachel, i know you this post is from a while ago, but the painting on your living room wall. of the man and the water, is that a painting of god? if yes, could you tell me where you purchased it from or who painted it? it is truly beautiful. Thank you! Beautiful HOME I love it all so much! WHERE IS THE ENTRY CHANDELIER FROM? MAYBE RESTORATION HARDWARE BUT NOT SURE. Hi! Where is your rod iron banister and Balcony from? What dimensions (how big) is your gallery wrapped “walking on water” portrait from rEflectioms of christ? Could you please tell me the paint color that you used in the main living areas of your gorgoues home? What is the BEIGE SEAT calleD, where can I find A SIMILAR ONE. Where did the chandelier come from? I must have it! Hi there! Where did uou get your coffee table? I love it! Love this room. Can you share info on the gold and glass shelving etegar! just wondering about the jesus picture on the wall. Do you know where I can get it? Hey! :) Where is that beautiful art of Christ on water from? Or by whom? I would love to get it too! Thank you! I love your home. It is truly stunning. I know your husband built your fire place. But would you be able to tell me is it all stone? and where did you find your brick at for the inside? Thank you! WheRe did you purchase that picture of jesUs at the shore? Theres a sonG About that (in spanish and English); makes me cry.., thank you. Gorgeous gorgeoUs!!! What are tHe dimensions of your fireplace!! I love love it so much. And wHat is it made out of stone? If so where did yiu get such a girgeous piece? YOur fireplace is amazing. We are building a modern farmhouse and have a 10 foot wide space to create a fire place/hearth. I was going for a different look until i saw yours!! Stunning. If it’s not too much trouble, could you tell me the approximate dimensions (I see that it goes up forever, but how wide is it and how tall is your mantel? Thank you in advance!